Five Iron Frenzy’s new DVD is packaged professionally, with quirky cover art and a bonus “coaster” disc, on which is printed directions for using it as a coaster. 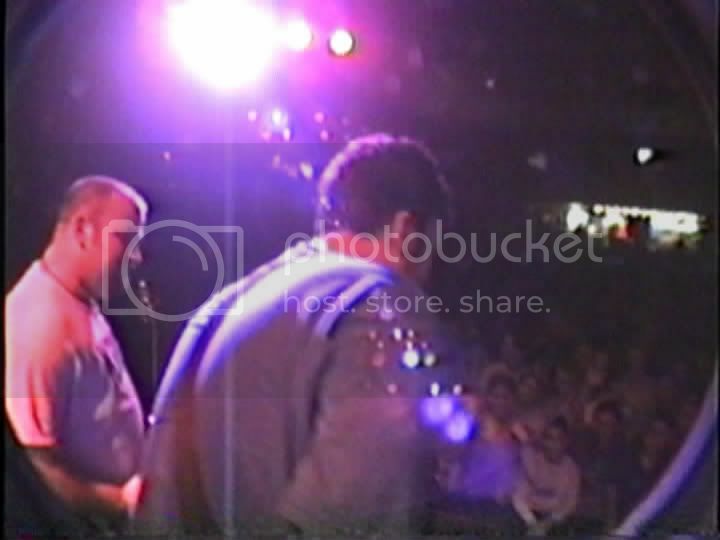 It does contain some good material, including their entire final show in Denver. 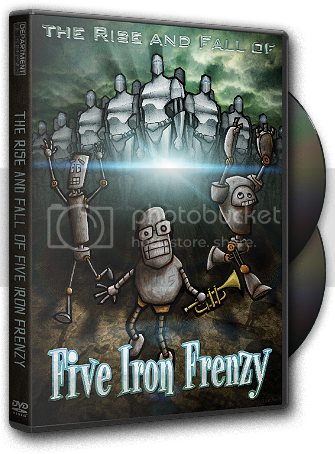 The primary draw for fans of Five Iron Frenzy will be Roper’s epic documentary. It becomes immediately apparent that this isn’t a professional production; while not dreadful, it is a little crudely constructed. But it’s not meant to be a festival-worthy documentary. It’s a labor of love extended to the myriad fans who supported Five Iron for nearly a decade. The lifespan of the band is presented chronologically, with a prologue, followed by a chapter for each year, and capped with an epilogue. The band’s formation and early years are discussed, aided by recent interviews with many of the band members. Roper directs these interviews, and as the other members of the band are talking directly to him it makes their interviews more personal. 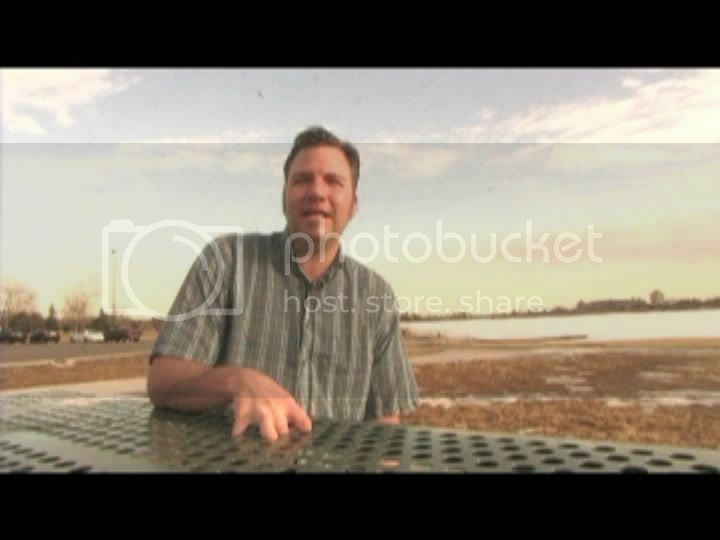 Interspersed with the straight-forward interviews are a great deal of old photos and home videos. It’s interesting to see their humble beginnings, as they get together to practice and road trip across the country to play gigs. There are amusing moments, such as when Roper gets pulled over by a cop on their way to the Cornerstone music festival. The nerdy goofiness of the band’s pop/punk/rock/ska style is apparent as the band embraces random goofiness and silly behavior. Sleeping on picnic tables at a rest stop on their way to Bushnell, Illinois, is part of the lifestyle. These early years seem the most care-free, as they are young and willing to punish themselves for their music and ministry. Later years contain some troubled times for the band. Their status in the Christian music industry enables them to play many lucrative church shows. But their heart lies in playing secular club shows, where their positive Christian music has a chance to reach a broader audience. Struggling to gain legitimacy in the secular music world, they are also disheartened at the lack of musical credibility in the Christian music scene. The record labels, promoters, and churches are eager to provide safe, comfortable, and profitable concerts to youth groups. A moment when Five Iron, headlining alongside the two other heavies of the Christian ska world, The Insyderz and The OC Supertones, refuses to wear suits and instead dons Star Trek uniforms highlights their desire to break away from the traditional Christian music mold. The documentary doesn’t gloss over the difficult and troubling times. The band members talk about their own personal struggles, family issues, and the desire for a normal life that interfere with the constant need to tour. The decline of the band and their mutual decision to walk away offer some poignant moments. Just as some of their songs lean toward the melancholy, so does the film linger on some of the sadder moments of their time together. It would hardly be fair to judge the film on a traditional scale. It is a personal project, made with great sentiment and care, if not professional technique and style. Running about three and a quarter hours, it documents nearly every aspect of the band’s years of existence. 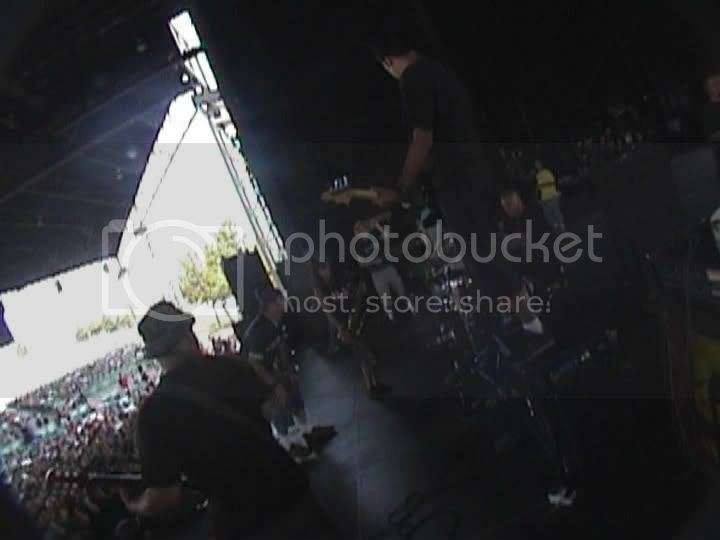 Fans of the band will enjoy a great deal of old photos and home videos, in addition to personal insights from various band members. If you consider yourself a fan of Five Iron you will certainly want to experience the massive amount of footage, both silly and historical, that Roper managed to cram into the documentary.